Valentine’s Day is fast approaching, and all sweethearts want to look as exciting and dazzling as they possibly can. You look into your closet to find something that will really stand out for your date, but nothing strikes you. You ponder about the look that you want to convey, but it is not in your closet. Maybe you can put together some items that you have not had together before; perhaps nothing appeals to you. You want an outfit that will simply knock his socks off. Not to worry, many women have this dilemma in anticipation of a fun, love-filled evening. Consider going down to the English Village where they will provide you with a personal stylist who will assist you in finding just the right garments from their selection of Women’s clothing. Take a look at the new Shilla the Label Beyond Lace Trim Dress. This is the perfect dress for evening or casual wear. Wear with heels or boots and step out in style. You can embrace your most feminine aura with the designer dress that was just made for you to show off those legs in its short mini style. Enjoy your Valentine’s Day in a dress that makes you feel special. If you prefer to wear pants for that particular day of love, go to the denim department for a pair of Black Orchid The Wild Bunch Jeans. 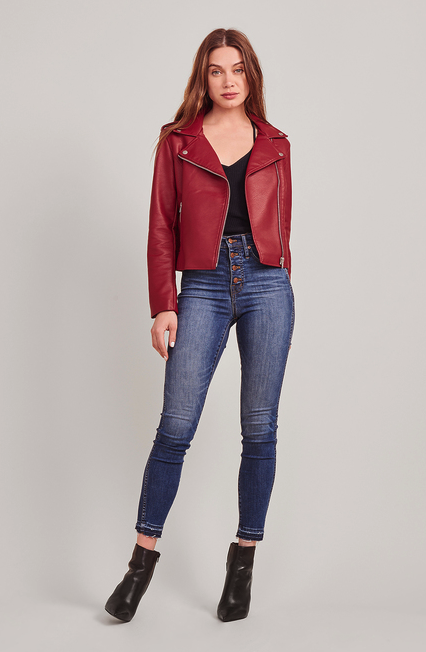 The skinny-legged jean styling will look great with boots or a pair of high heels. Add a cute top, and maybe a jacket, and you are ready to dance the night away. The light denim color can be accented with various colored accessories. These skinny, straight jeans will hug your body just right as you make the perfect impression on your date. You may want to go to the English Village and speak with a personal stylist about women’s clothing items that would provide a tough-but-feminine touch. The BB Dakota Just Ride Jacket is just the piece of clothing to add with the jeans, or as a wrap to go with the Lace Trim Dress. Either way, you can not go wrong with the jacket. It will keep you warm if the evening is a little cold or will help you make a fashion statement in any type of weather. Even if you are going out on the town with some girlfriends this Valentine’s Day, make an impression that everyone will remember. Choose your designer outfits from the English Village where you will always get women’s clothing that is designed by designers who know what women like. Personal stylists are available to help with any fashion problem you may have, and will gladly help to dress you up for any occasion. Be picturesque in whatever you choose to adorn yourself in this Valentine’s Day, and enjoy the day and evening to the max.